“This November we visited Amani again to support the children of the orphanage. This year the people of Amani are building two new dormitories and we were able to sponsor the windows and the outer doors of this building. We want to thank all of our friends and family who donated generously for this. to school by bicycle instead of being brought by car and he also sold some of his personal belongings all in order to save small amounts of money. Doing so he was able to collect more than 200 US $ all on his own. No small feat for such a young boy. He even filled a box with toys to give to the children of Amani. Amani’s youngest supporters are the same age as our children themselves! Lieselore is only 7 years old. 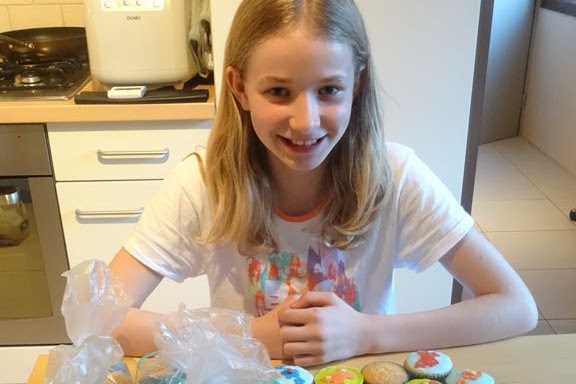 She fundraised € 210 (Euro) by making and selling bookmarks, keyrings, cookies and biscuits. She even donated all her allowance from household chores. Lieselore’s incredible donation helped us do some much needed repairs at Amani. Her generous gift funded tiling the boy’s dormitory. This ensures our kid’s home is easy to keep clean and hygienic, even in the rainy season! This November Eddy and Chantal from Belgium visited us again and brought some food (rice, beans and bananas) for our children, some books for the new library and a generous financial donation towards our 2018 solar project. They raised this money with the help of family, friends and one incredible twelve year old girl. Lotte, a young girl from Belgium, worked hard for several months to fund-raise for Amani. She earned money doing household chores for family and friends, washing cars, helping out at a butcher shop making sausages and hamburgers, and baking home-made biscuits for sale. She even sold some of her personal belongings. Lotte didn’t stop there! She also made herself more aware of the lives of children in Tanzania; she used less water when taking showers, spent less time on the computer and went to school by bicycle instead of being brought by car. Lotte’s hard work paid off and she raised € 280. This meant she even bested the total raised by her older brother Seibe, who led his own fantastic fundraising effort when he was her age. Lotte not only contributed towards the purchase of new solar lights for Amani but even donated some of her toys to the children. With solar energy, Amani’s kids will be able to study (and play) past sundown! Thanks Lotte! On behalf of Amani Children’s Home and Amani foundation team, I would like to thank your contribution for building the wall with the gate, buying mattresses, painting dormitories, supplying water to all building in the center, putting tiles in girl’s dormitory, building a place for keeping cow grasses, refilling the fire extinguisher, bed covers, new stove (10 – 25litres), buy new beds, new tables and chairs for dining hall and new mosquito nets. Your support helps us continue in our mission and assist our kids in our center. The generous support of individuals like you makes it possible for our organization to exist and to make Amani a great place to live. We are delighted to announce that this year Ms Edna Lyatuu Hogan who resides in Dublin will be running the VHI Flora Women Mini Marathon again to raise money for our orphanage centre and other social enterprises in Tanzania. Edna has been a great supporter of Amani orphanage for many years and she has done a lot for the centre-from donating computers, school essentials for our kids, food and money. To us she is a mother to our orphans, a sister to our volunteers and a friend to us all here. Please join Edna at this year’s marathon and help her raise the much needed funds for our children and other charitable projects that she is very passionate about. With so much love from all the children and staff at Amani Children Home. Volunteers from Leap visited last month and generously helped us reconnect and improve our water facilities. Thanks Leap for your donations of food and hard work! Now, even during the historic drought affecting much of East Africa, we have a reliable supply of fresh water for drinking, watering and washing! As the new year begins, we’d like to take a moment to reflect on some of the generosity of the past year. Our 2016 archive is filled with stories of donations and projects that make it possible for Amani to exist. Among them, we are grateful for the continued support of Eddy, Chantal and Siebe Verhoeven who contributed doors and windows to our dormitories and establish electrical infrastructure for our classrooms, built by John McCauley. A more recent donation helped us install more electricity, provided food for our kids and got our motorcar (“called a tok-tok”) up and running again! This way we can drive in supplies, saving time and energy. Thank you to the Verhoevens, and all the incredible people who helped make 2016 a great year. We’re excited to continue our work as we ring in 2017. Amani would not be here were it not for the kindness of our international sponsors. We love to feature stories of projects and donors on our website. However, it can take time to post updates as we are all volunteer staff with many responsibilities. If you would like your story featured, please email us information about your project! When donors and volunteers send us photos and articles we are very excited to publish them. Not every donor wants to be acknowledged publicly, so we rely on your approaching us or completing our forms for documentation. We’d like to celebrate the long-time contribution of two of our donors, Richard and Mable Seymour, by featuring a write up in their own words. We visited Amani Orphanage on April 11, 2013 while on tour of Kenya and Tanzania with Vantage Travel. Our tour director was Seif Mohamed. Seif asked the group on the tour if they would like to visit an orphanage and all agreed to do so. While there, we met Amiri Adamu and others. While taking a tour of the then-current facilities, I noticed a large black water tank laying on the ground and that caused an inquiry. We had see the new showers and toilets, but were told they did not have water. Also, we were told that they did not have the funds to erect the water tank on a tower so that the water from the tank could be piped into the toilets, showers and wash basins. Upon getting home, I worked with Seif Mohamed & Amiri Adumu to get an estimate for the cost to build a tower, erect the tank on the tower and pipe water into the showers, toilets and wash basins. That began our more deep involvement with Amani Orphanage. This first project raised money from a number of people in our community and church to buy the materials for erecting the tower, placing the tank on the tower and piping the water to the showers, toilets and wash basins. Another project helped to purchase a number of metal beds with mattresses. One of the key projects that came next was the “canal” and dry well to dispose of “dirty water”. Another project that was water related was the purchase and installation of a pump motor to bring water from the community well to the water tank. Upon making a photographic presentation at our Church which included pictures of the orphanage, one of the ladies in charge of the Knitting Group suggested that they could make knitted blankets for each of the 38 kids in the orphanage. That launched a knitting project which actually exceeded the 38 blankets for the kids. The ladies made various sizes of blankets including several adult sized blankets. Many donations have been made for purchase of food and other supplies for the orphanage.